^ Greenwood, N. N.; & Earnshaw, A. (1997). Chemistry of the Elements (2nd Edn. ), Oxford:Butterworth-Heinemann. ISBN 0-7506-3365-4. ^ Pauli, W (1926). “Über das Wasserstoffspektrum vom Standpunkt der neuen Quantenmechanik”. Zeitschrift für Physik 36: 336–363. Bibcode: 1926ZPhy...36..336P. doi:10.1007/BF01450175. ^ Kleinert H. (1968). “Group Dynamics of the Hydrogen Atom”. Lectures in Theoretical Physics, edited by W.E. Brittin and A.O. Barut, Gordon and Breach, N.Y. 1968: 427–482. http://www.physik.fu-berlin.de/~kleinert/kleiner_re4/4.pdf. ^ Duru I.H., Kleinert H. (1979). “Solution of the path integral for the H-atom”. Physics Letters B 84 (2): 185–188. Bibcode: 1979PhLB...84..185D. doi:10.1016/0370-2693(79)90280-6. http://www.physik.fu-berlin.de/~kleinert/kleiner_re65/65.pdf. ^ Duru I.H., Kleinert H. (1982). “Quantum Mechanics of H-Atom from Path Integrals”. Fortschr. Phys 30 (2): 401–435. Bibcode: 1982ForPh..30..401D. doi:10.1002/prop.19820300802. http://www.physik.fu-berlin.de/~kleinert/kleiner_re83/83.pdf. ^ Messiah, Albert (1999). Quantum Mechanics. New York: Dover. pp. 1136. ISBN 0-486-40924-4. David J. Griffiths, David J. (1995). Introduction to Quantum Mechanics. Prentice Hall. ISBN 0-13-111892-7. Section 4.2 deals with the hydrogen atom specifically, but all of Chapter 4 is relevant. Bransden, B.H. ; C.J. Joachain (1983). Physics of Atoms and Molecules. Longman. ISBN 0-582-44401-2. 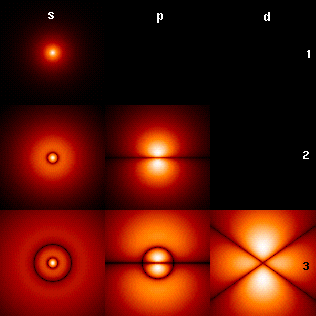 The Hydrogen Atom: Wave Functions, and Probability Density "pictures"